Chrestos - Vitamin c for your company. We make the world a healthier place. Chrestos is the only statistical health consultancy on the market. Founded in 2006, our company has been headquartered in Essen since 2016. The company is run by Dr. Boris Weimann and Janina Buschmann. Our team consists of statisticians, economists, data scientists as well as experts in the field of health care management. The company comprises of three business divisions. In the business division CHM (Corporate Health Management) we accompany our customers on their way to a sustainable and successful Corporate Health Management system. In the CRO division (Contract Research Organization) we support our customers in planning and analysing clinical studies. In our third business division CTW (Chrestos Temporary Work) we offer our customers maximum flexibility in order to support them in the area of health in their companies if required. What we stand for, what we strive for and the way we work. Health is a matter that is truly dear to us! As a statistical health consultancy, it is our goal to actively contribute to promoting good quality of life and health in the future. It is our daily task to enable patients to lead a better life and employees to work under healthier working conditions within the company. It is our vision to shape a positive future worth living and to grow in a sustainable and profitable manner. The close relationship to our customers, business partners and colleagues is based on respect and trust. Passion and a strong team spirit are our motivation to think outside of the box. This is how we perceive our work and regard it as the key success factor in our field. 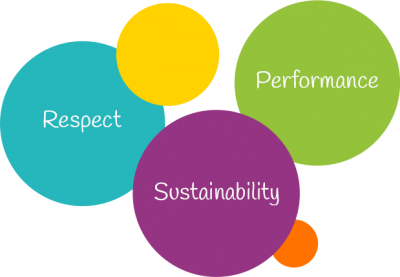 Our daily activities are based on our company values respect, sustainability and performance. And we live by these values! When we meet people, we always show them our deep respect. Integrity, honesty, trustworthiness and empathy are the basic requirements for respectful solidarity. Good relationships are based on clear communication. We would like to keep you in the loop at all times. We put great emphasis on transparency at each step of the process as well as when we present the results. Your trust is our greatest asset! As a company, we are not only responsible for our customers, our workforce and our business partners, but also for the future generations. We are convinced that there is no alternative to a sustainable approach which is why we strive for meaningful and solid partnerships with our customers. Performance and service are important to us and above all excellent quality! We work with diligence, clarity and flexibility in order to achieve optimal results. The foundation of our success is our customers’ satisfaction. We not only focus on responsibility, we carry it out. The concept of sustainability is deeply embedded in our company values and has been a part of Chrestos since its foundation. Our target is to establish a balance between social, economic and ecological needs in order to ensure a sustainable future. One objective of Chrestos management is to create ideal working conditions. It is important for us to take responsibility for our team especially considering their health and wellbeing. Compliance with the principles of non-discrimination and equal opportunities at the workplace. Fair payment and sharing in the company’s success. Compliance with contractual working time. Entitlement to regular paid leave. Vocational qualification, further training and employee developement. As service providers we not only offer Corporate Health Management (CHM) to our customers, but we also establish an internal CHM program. As part of this program we carry out regular surveys and obtain feedback in order to evaluate our employees' subjective perception of their health. We also offer an extensive health program promoting health at the workplace, in the area of nutrition, exercise and relaxation. Within the framework of our internal CHM we also perform regular risk assessments in order to create ideal working conditions and identify potential risks at an early stage. We want our employees to use and develop their strengths, interests and talents while working at Chrestos. Guaranteeing futher education and training is one of our major objectives. We offer interesting and challenging educational possibilities not only in the professional field but also relating to personal development. At Chrestos every employee starts with a training course dealing with the General Equal Treatment Act (GETA). This is important to us as a foundation for good communication within the team and with our customers. This is followed by training courses that pave the way for new employees to perform their tasks with competence and reliability. All team members undergo at least one training program per year in order to develop and improve their skills. Our managers who commit themselves to the principles of healthy leadership, share their ideas in management workshops on a regular basis. Diversity has a significant meaning to us. Our team consists of people with diverse nationalities from Kazakhstan, to Iran, Turkey, Romania, Poland and the USA, and an equal distribution of men and women. It is our deliberate intention to enrich our team with newcomers from different parts of the world. We believe that a varied mix of cultures, experiences and age groups offers an ideal work environment in order to create a positive future for Chrestos and our customers. It is important to us to take over social responsibility as a company and to invest part of our economic equity in supporting projects that are worthwhile. Since health is one of our primary interests, we sponsor a popular sports team, the cycling club “Rad ClubMusketier“ in Wuppertal e.V. 1968. Exercise is the key to a healthy body and mind and we plan to widen our commitment in the future. The Chrestos management does not explicitly pursue the strategy of profit maximization. Our objectives are sustainablility, healthy growth, job security, providing new positions as well as the creation of ideal working conditions. These are our key areas of interest when considering our economic initiatives. Furthermore, sustainability also means that our customers will remember us in the long-run and notice that mere economic profit is not our main goal at Chrestos. We also see our share of responsibility in the area of environmental protection. Our employees treat this topic with awareness and as an employer we principally support the use of public transportation. Business trips are primarily done by train. We consider company bikes, a perfect alternative to company cars and appreciate colleagues choosing this option in order to do something good for their health and the environment. When considering our office equipment we make sure that our suppliers are equally committed to our concept of sustainability. Waste sorting, avoiding unnecessary printouts and using recyclable packaging such as glass bottles are common in our daily routines. We are convinced that ongoing ecological awareness, fosters self-responsibility. Passionate. Crazy. And simply stronger together. We do what we do because we believe in supporting people’s health.